Hey All! Well, I did it. I took my word count down several notches after the effect of committing to another exciting NaNoWriMo experience faded away. I set my goal to half of what my original goal was (50,000) and made it 25,000 words instead. I passed the milestone three days ago and haven’t had the chance to write a blog post. I am really happy with what I was able to get written. This was a really hectic month for my family and I’m glad I took the chance and made an effort to write this. My total word count goal was: 25,537 words!!!! I didn’t even get halfway through the sequel to The Monkeys but I found that I was more interested in perfecting The Monkeys than I was writing this. I found that my story was being forced which is why I brought my goal down. We never set a limit as to when we could no longer change our word count goal, but I decided to change it about two weeks ago. I picked up another manuscript that has been sitting around and wanted to finish editing it. It was a third draft and has just been sitting here. I guess that’s where writers have problems. Another more eye-catching story comes along and you dump the one you had. I am not dumping it, I am just postponing it until later. 🙂 I was hoping to have the Monkeys Trilogy finished by the end of February but unlike my first series, I am not sure where this story is going. 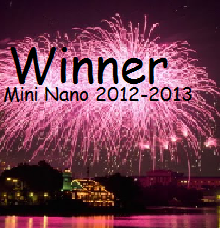 And last but not least Diva from Jewels from Jordan, for joining my mini nano and supporting all the mini nanoers through blogging.